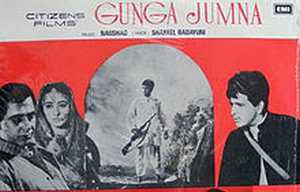 Ganga Jamuna is a 1961 Bollywood film produced by Dilip Kumar and directed by Nitin Bose.The film stars real life brothers Dilip Kumar and Nasir Khan as two brothers on opposing sides of the law.The music of this film is by Naushad and the lyrics by Shakeel Badayuni.The film also stars Vyjayantimala and Helen. Aruna Irani makes a brief appearance as a child artist. Ganga and Jumna are brothers living a hardscrabble village life.Ganga spends his days working with his mother as a servant in the home of the zamindar’s obnoxious family, while Jumna, a promising student, focuses on his schoolwork.After their mother passes, Ganga pledges himself to supporting his younger brother as they grow to adulthood.The adult Ganga (Dilip Kumar) is a spirited and hardworking fellow, unafraid to take on the zamindar when necessary, while his brother Jumna (Nasir Khan) is more measured and cautious.Ganga sends Jumna to the city to study, and supports him with funds that he earns driving an oxcart and making deliveries for the zamindar. But things get complicated when Ganga saves a local girl, Dhanno (Vyjayanthimala), from the zamindar’s lecherous assault.The zamindar (Anwar Hussain) gets his revenge by trumping up a robbery charge against Ganga, landing him in prison.Upon his release, Ganga learns that his brother has become destitute, and attacks and robs the zamindar in a rage.Soon Ganga finds himself an outlaw, and, with Dhanno at his side, he joins a gang of bandits camping out in the wilderness.In the meantime, Jumna meets a fatherly police officer (Nasir Hussain) and becomes a police officer himself. It isn’t long before Jumna’s professional wanderings take him back to the village of his birth, where he must square off against his outlaw brother, in a showdown between duty and family.